While you likely have other projects for your home that need to be taken care of, make sure you don't put off any garage door repairs for too long! Even if it's still working now, it may not be soon enough. Using your door when it's having troubles with its parts increases the stress on them and makes them break down even faster, creating further problems. That's why getting it taken care of as soon as possible is for the best. Your garage door makes up a huge portion of the front of your home, so keeping it pristine is vital for a good first impression! If any panels of the door have cracks or dents from an accident, we can easily repair the issue or replace the panel completely with the appropriate size and color. Our team is familiar with all major brands from Clopay to Amarr, so whatever type your door is, we can help! The rollers over your garage door help it slide along the track and may be the problem if it has started to slow down and grind along instead of slipping easily over them. We'll carefully pry open the track to get to the rollers and see if they simply need some repairs or require replacements. In either case, we'll have it done before you know it so your door will work smoothly again! It's not uncommon for the track of your door to get dented or tweaked over time with use and make it more difficult for the door to move along it. The door may even pop out of the track in a spot, creating even further problems! Our technicians will inspect the track thoroughly to determine what's causing the issue and get it repaired, or carefully replace the track entirely if need be. Garage Door Repair Cornelius is here to help get your door back in shape again! My garage door won't open manually. How come? If you're finding it difficult to open your garage door manually, chances are there is a problem with your springs. Garage doors can be very heavy and the springs are responsible for the force needed to open and close them. If they’re worn or broken, they simply lack the force to open the door manually or via the opener. If you happen to be anywhere nearby when a spring breaks, you can get really hurt, as there’s a chance it will go flying or whipping around when the stored tension gets released suddenly. Also, the door could drop as a result. Whatever you do, don’t try to open it if you think you’ve a broken spring on your hands. Let a professional technician deal with it instead. All garage doors are heavy. Even the smallest one can weigh 130 pounds at the very least. Add reinforcement, glass or other materials and the weight can quickly climb up to over 350 pounds. Then, you also need to look at thickness. Once you start looking at double car garage doors, for wider openings, the weight can topple 400 pounds quite easily. Now let’s translate that to pressure. Just imagine the amount of tension the garage door springs are under to be able to lift and lower this heavy slab on a daily basis for years. Now you see why dealing with them can be so dangerous? 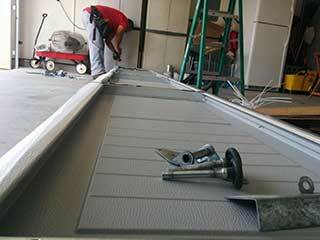 A garage door with a roller that has popped out is usually an easy fix. Most of the time, all you need to do is pop the roller back into the track. But if you try to this you need to be very careful and make sure the springs aren’t deformed or cracked and about to break from the tension. Check the tracks for dirt and debris as well. The roller may have popped out because of some bending or a blockage, and it’s important to deal with that otherwise the scenario will simply repeat itself. To be on the safe side, you’re better off seeking the help of a qualified technician.